If you are interested in any of the VMZINC® products shown here or have questions about alloys not listed, please contact us for stock and pricing information. NATURAL VMZINC® is the original zinc: shiny and smooth when it comes out of the mill. When installed on an exterior, NATURAL VMZINC® will form a beautifully textured grey patina. The patina’s evolution can take several years based on the location of the panels. This transformation of the zinc surface allows for dynamic and striking results. For installations in which a visible weathering process is not desired, a different VMZINC® option should be selected. If properly installed according to VM Building Solutions installation guidelines, a NATURAL VMZINC® roof can maintain its beauty for well over fifty years, and walls can last more than one hundred years. 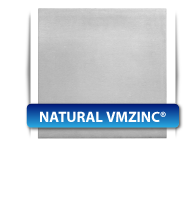 Like all VMZINC® products, NATURAL VMZINC® requires no scheduled maintenance. Of course when people think about zinc, they naturally think of roofing and cladding. But VMZINC® strikes quite the pose when used in a variety of interior applications, such as facades, bar tops, counter tops, and fireplace mantels. If you are interested in VMZINC® for an interior application, please give us a call. QUARTZ-ZINC offers a similar appearance as the natural patina developed over time as Natural Zinc by VMZINC. No other pre-weathered zinc captures the depth of texture of an evolved patina like QUARTZ-ZINC. The durability and beauty of QUARTZ-ZINC is unparalleled, especially when compared to zinc products of light hues. 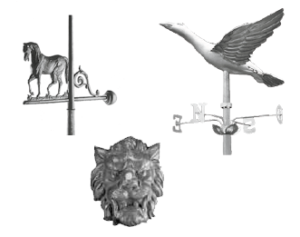 In applications that will have varying exposures to the elements and will, therefore, weather at different rates, this reliability of appearance is a tremendous asset. On the luminance scale for measuring colors QUARTZ ZINC falls into a Y-Factor range of 22-25. Every batch of QUARTZ-ZINC is measured and the results are documented. Beautiful color variation is expect in natural materials. While white marks can occasionally appear on the zinc surfaces that are unexposed to rain or are not regularly rinsed, such superficial marks do not reduce the material’s lifespan. If properly installed according to VMZINC installation guidelines, a QUARTZ-ZINC roof may maintain its beauty for well over 75 years, and wall cladding may last over 100 years. 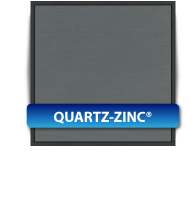 Like all VMZINC envelopes, QUARTZ-ZINC requires no scheduled maintenance. The rich, charcoal black of ANTHRA-ZINC was the first pre-weathered zinc offered by VMZINC thirty years ago. On the luminance scale of measuring colors ANTHRA-ZINC falls into a Y-Factor range of 5-7. Every batch of ANTHRA-ZINC is measured and the results are documented. Beautiful color variation is expect in natural materials. Based on the type of installation, surface exposure to weather, and geographical conditions, ANTHRA-ZINC may slowly and gradually lighten over time to dark grey. While white marks can occasionally appear on zinc surfaces that are unexposed to rain or are not regularly rinsed, such superficial marks do not reduce the material’s lifespan. Although ANTHRA-ZINC was originally intended for flashing and rain ware for slate roofs, architects have come to appreciate the velvety look of ANTHRA-ZINC and use it increasingly as a building product for walls and roofs. ANTHRA-ZINC can be combined with wood, glass, or concrete for impressive results. If properly installed according to VMZINC installation guidelines, an ANTHRA-ZINC roof may maintain its beauty for well over 75 years, and walls may last over 100 years. 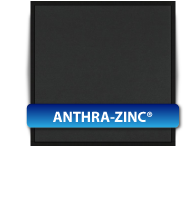 Like all VMZINC envelopes, ANTHRA-ZINC requires no scheduled maintenance. Launched in 2007, PIGMENTO® by VMZINC® allows architects to create colourful new visions with an expanded palette of mineral hues. PIGMENTO® uses modern pigment technology and showcases the naturally grained texture of pre-weathered zinc. The result is a revolutionary new look that blends with other coloured materials and reflects the light of its environment. The PIGMENTO® range is created by adding mineral pigments to a durable protective coating, creating beautifully organic red, green and blue pre-weathered zincs. The subtlety and depth of PIGMENTO® is unsurpassed in any building material available. The textured aspect of the pre-weathered zinc shows through the color, just as the grain of wood is visible through its coat of varnish. Like all VMZINC® envelopes, PIGMENTO® requires no scheduled maintenance. With AZENGAR®, VMZINC® launches the next generation of zinc with lighter characteristics that multiply the opportunities for innovation. AZENGAR is the most matte and lightest shade of zinc on the market. It stands out with its rugged uneven surface, which catches natural light and gives projects a timeless appearance. While weathering charactistics can vary with geographical conditions and installation practices, the zinc surface’s metamorphosis allows for vibrant and remarkable results different than other types of zinc products. We offer a range of VMZ pre-fabricated panels to help give your structure visual interest with an attractive, high quality texture. Used primarily for wall cladding, the flat lock panel creates visual interest with texture. These panels can be used for internal or external applications and be installed vertically or horizontally. These panels can be installed up to a maximum of 100’ in height in external applications. The interlocking panel utilizes a tongue and groove system with concealed fasteners, for which panels may be installed vertically or horizontally. Modules for this panel system are available in 8”, 10”, or 12” on centre, with reveals possible in ¼” (6.35mm), ½” (12.70mm), and ¾” (19.04mm). It should also be noted that reveals in this panel system can vary in height. Finally, these panels are also available with perforations. Learn more about the tech specs here. The corrugated panel is one of the oldest and most commonly seen forms of metal roofing and cladding. This panel system represents the most economical and practical, due to the ease of installation. It can be used in both internal and external applications. Perforation is also possible. Learn more about the tech specs here. The ADEKA® Panel is another panel which creates a strong visual textured effect. It is very easy to install and can be used for both roofing and cladding applications. Due to the polystyrene backing, the ADEKA® panel system offers greater sound insulation. The ADEKA® panel system has been rated up to 220 PSF uplift. The Metafor Panel system utilizes a hidden S-lock providing seamless integration of the panels. This system is used for internal and external wall cladding. Panels may be installed horizontally or vertically, with the option of being perforated. Façades designed with VMZ-Composite Material (VMZ-CM) offer the possibility of larger scale elements that are flatter than the single skin versions. With VMZ-CM one can also achieve complexities that in single skin would be impossible to achieve or only with compromises in the flatness. VMZ Composite is a multilayered panel made up of two sheets of zinc that are 0.5 mm thick and thermo-glued on either side of a mineral-rich polyethylene core for optimum reaction to fire. It is manufactured using tested Mitsubishi Plastics Composites America technology. Read more about this product’s tech specs here. The Dri-Design® Cassettes Wall Panel System, fabricated by Dri-Design, is an advanced interlocking panel system which is offered at an affordable price due to the automated manufacturing process involved in its creation. The panel system is called “Dri” because it uses no sealants, gaskets, or butyl tape in the panel joints, which eliminates maintenance and streaking. Dri-Design panels are a great choice for those wishing to embrace sustainability, as they are 100% recyclable, unlike composite or foam panels. Finally, Dri-Design installation time is among the shortest of any other metal panel system. For more information please take a look at the tech specs or visit the manufacturer’s site. For almost 100 years, zinc has remained the most commonly used material for rainwater goods in Europe. Zinc rain water systems are not only elegant, but offer outstanding malleability, and unsurpassed longevity. CBC Specialty Metals is proud to distribute Ornametals’® complete line of pre-fabricated VMZINC® rainwater components, which come delivered in special kits with gutters, concealed brackets, end caps, running outlets, rainwater diverters, end caps, and self-locking pipe brackets. Offered in a range of finishes: Natural zinc by VMZINC®, QUARTZ-ZINC and ANTHRA-ZINC, but not available in PIGMENTO. VMZINC® Ornaments are the only direct descendants of the 19th century workshops and have been making ornaments in zinc, copper and lead for over one and a half centuries. With the “Ateliers d’Arts Français” signature, they have collected old catalogues, architectural plans and dies which enable them to make identical reproductions of period pieces and thus contribute to conserving an ancient heritage. They have also developed a standard range of ornaments in order to perpetuate the tradition of roof ornaments, passing on a unique, noble art to future generations. Please view the VMZINC® catalogue for a full list of available ornaments and please call us to learn more.